In Zermatt, there is the Webcam Zermatt. 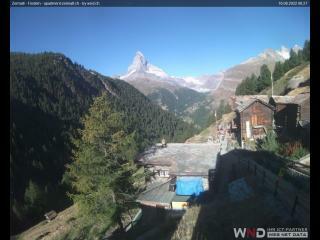 The webcam Zermatt is regularly updated with new pictures. Track the current weather in Zermatt Wallis with the webcam ZERMATT. Weather Webcam Zermatt: The Zermatt ski resort community adjacent to Italy. The classic passage of the Theodulpass from Zermatt to Italy is impassable due to ice cover only for pedestrians and skiers. Zermatt is a mountain climber center of the Alps and a world-famous winter resort of Switzerland. Weather Webcam Gornergrat Bahn: Keep up with the time-lapse Weather Webcam live weather Gornergrat near Zermatt. Zermatt is a popular tourist destination in the canton of Wallis / Valais. View of the world-famous Matterhorn. Who wants to get to know the Alps at their best, you'll soon realize - at Gornergrat is no way around. With its sunny year round viewing platform at 3131 m the Gornergrat counts the top tourist destination, not only because of the altitude. Surrounded by 29 four thousand meter peaks, the largest Swiss Mountain and zweitlaengsten glacier in the Alps, it offers a spectacular mountain panorama, which can not be overpowered gender. And that comes with the "Matterhorn Railway" within reach. The Weather Webcam Zermatt shows the Gornergrat Bahn.